Not many organisations are equipped with a detailed leadership development plan to help nourish their internal pool of talents. 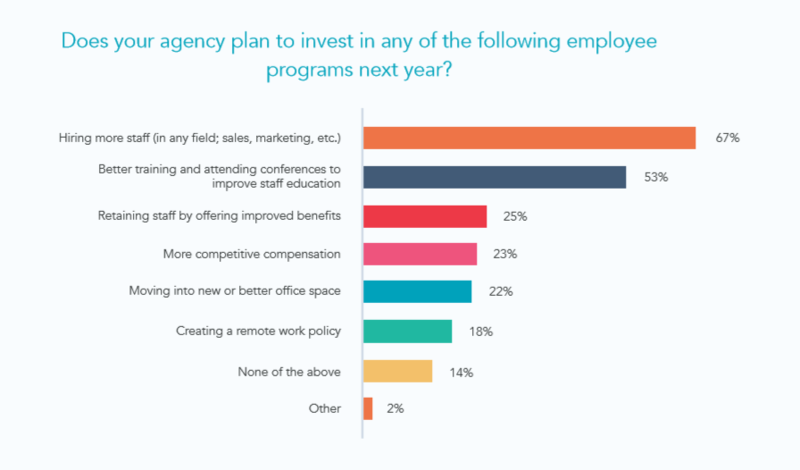 According to Hubspot 2018 Marketing Agency Growth Report, nearly 70% of agencies struggle with finding the right talent for their currently vacant positions. Yet, they still proceed to hire more people. Meanwhile, 53% plan to invest in employee training and only 25% plan to retain their staff. Also noted in the report, even when an agency has the right talent in place, only 50% of agencies structure their companies in a way that encourages career growth. This is a red flag that signals agencies’ risk of losing talent to other agencies or to other industries. Recruiting new talents can help bring in fresh ideas and enthusiasms, however, the organisation stands a high chance of overspending on re-hiring and training these newcomers. Company culture and employee engagement are among the major concerns for the C-level managers. One in three employees will end up leaving the company within their first year due to disengagement. Employees do want to know if there are opportunities within the company that can help leverage their career advancement. A well-established leadership development plan shows your appreciation towards your employees. Many managers and organisations underestimate the power of appreciation and recognition. If you show that you care about your staff’s future, the likelihood of them remain loyal to you will be higher. Higher loyalty leads to an increase in productivity as your employees are more engaged in their day to day activities. Not to mention, loyal employees are more likely to go above and beyond expectations to ensure the results are of high quality. We can learn from Disneyland how their staff always appear cheery and smiling. According to Bruce Jones, programming coordinator for the Disney Institute, guests are more likely to return to Disneyland if their interactions with the park employees were positive. And all employees (dubbed “cast members”) are only able to complete such draining and high-pressure tasks if they have great leadership that supports them. Disney knew first-hand how crucial is internal leadership development to the success of the entire enterprise. Leadership development or Succession planning? Why not both? The HR Department can’t just wish for new recruits falling out of the sky. Nurturing your existing pool of talents and let them know that you have planned for their personal development is an effective way to combat such predicament. The purpose of establishing a succession plan so that not only your C-level positions but also other key managerial roles are never left unattended. Organisations should have a ready to take charge pool of “potentials” the organisations invest their time and effort in. Marrying succession planning and leadership development is like having the best of both worlds: alert the employees about the skills needed for the senior positions whilst equip them with proper training, coaching to develop stated skills. There is no “one size fits all” when it comes to leadership development strategy. Many overlook the program altogether due to a shortage of time and human resources to take lead in the project. An effective leadership development plan starts off with assessing the organisation’s goals and vision. If your organisation seriously thinks of investing in building a leadership development program, do take into account the global aspect where technology advancements intervene in the day to day operations. When the workplace becomes more and more decentralised, it calls for a great deal of highly effective communication skills. To get your message across, communication needs to be clear, transparent, and shareable across a multitude of platforms such as social media, virtual office sharing systems and more. Too complicated? Request a free Talent demo with us now!